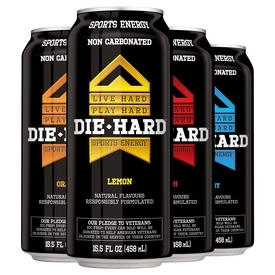 Leading Brands, Inc. (NasdaqCM:LBIX - News), North America's only fully integrated healthy beverage company, is pleased to announce the launch of DIE HARD Sports Energy Drink in both the U.S. and Canada. DIE HARD is the culmination of nine years of research and development by the Leading Brands team. This scientifically formulated elixir combines the benefits of both sports and energy drinks to give athletes and others engaged in strenuous and stressful activity what they need: fast hydration, replenishment of electrolytes and an added boost of energy. DIE HARD Sports Energy Drink is non-carbonated, responsibly formulated, naturally flavored and sweetened with natural sugars, not HFCS. DIE HARD will initially be available in four flavors in 16 oz. cans. The phrase "Die Hard" was first used by Colonel Inglis of the British 57th Regiment of Foot at the Battle of Albuera in 1811. Colonel Inglis was badly wounded yet refused to retire from the field. He stood fast, calmly and repeatedly yelling "Die Hard 57th, Die Hard!" as his men exchanged brutal, close range musket fire. Keeping true to its namesake, DIE HARD Sports Energy Drink is making a Pledge to Veterans. $0.10 from every can sold across the U.S. will be donated to help American Veterans injured in the service of their country. DIE HARD will also work with retailers in Canada and elsewhere to support similar causes that are in keeping with the brand. Leading Brands Chairman Ralph McRae adds: "A dozen years of military service taught me that we can never do enough to help support, rehabilitate and re-train those injured while selflessly protecting what we believe in. Die Hard's Pledge to Veterans is, for me, particularly heart-felt. Our mantra at Leading Brands is 'Better Ingredients--Better Brands. In the case of Die Hard we should add 'Better Principles--Better Brands.'" DIE HARD Sports Energy Drink will immediately replace TREK and NITRO in the Leading Brands portfolio, giving the company another revolutionary new brand with superior margins that it can call its own.